Vizhinjam: After the dismal lows of last year, Vizhinjam is expected to be on the upswing this year, aided by high pressure from the public and the Government. With the introduction of IFC as the project consultant, things are expected to pick up pace. Land acquisition for the initial infrastructure is well in progress and the State has already gotten commitments from the Railways and NHAI to provide the rail and road connectivity for the project. An outlay of approximately Rs 500 Crores has already been allocated by the State Government. We can expect the restart of the tender process with a series of road shows by March-April and tender proceedings themselves to start and complete in the second half of 2010. Technopark: The formal commissioning of the Infosys campus will kick off a hectic year for Kerala's IT hub. Work on the 900,000 sq.ft Phase I of the UST Global campus has kicked off and is expected to achieve significant progress by the end of the year, enroute to a mid-2011 commissioning. The TCS Development Center is also expected to commence work by the middle of the year. The NEST and CDAC campuses are expected to open in the first half of 2010 while the work on the mammoth 1 million sq.ft building at Technopark Phase III is also in progress. All told, 2010 will see the addition of about 1 million sq.ft to Technopark's existing 4 million, with significant progress on the construction of another 3.5 million sq.ft. Technocity: After an exasperating, doldrum-ridden four years of land acquisition and background work, the land for Kerala's biggest IT infrastructure project - all 451 acres of it - is now with the Government. Working on the basic infrastructure is also expected to start in the first half of 2010. And if the Government or KSITIL (yeap, the same ol' one man company which is supposed to generate Rs 10,000 Crores of investment) do take up the minor task of finding developers for often bespoken "multiple SPVs", then we could see the work on the first phase of a project that could generate 100-150,000 direct jobs, start within 2010. Urban Development projects: Despite the utter chaos of recent times, the storm in a tea-cup called city development, finally seems to be sorting itself out. JNNURM work in the areas of water supply, storm water management and sewerage as well as services to the urban poor seem to have kicked off although other areas like urban transport seem to have mysteriously vanished. Except of course for the 30 Volvos and 120 non-AC, low-floor buses which are all set to hit Trivandrum's roads this year. Even when the Volvo's debut has not been as commercially successful as ideally should have been, with a minimum of intelligent route planning (instead of the "my guess is as good as yours" strategy currently in evidence) the services should be plying successfully on arterial routes as the year progresses. TCRIP should achieve substantial completion by 2010-end. We can expect to use the chronically delayed Bakery Junction flyover sometime in April. Work on the other pending corridors of TCRIP should also be substantially be complete by December 2010 with only the M.G. Road flyover to be completed in 2011. That means about 40 Km of world-class roads for us. With a bit of luck and interest from the Government, 2010 could also see the first stages of work on the transport components of JNNURM (if someone finally remembers them!) including several grade separators and the widening of several key roads. We could also see the commencement of work on the BRTS system, cleared by the Cabinet in July 2009. Fingers crossed on that one. Finally, 2010 will also see the much-maligned JICA-aided water project come good with an extra 80 million litres per day of water delivered to the city and its suburbs. Highway Development: The tenders for the Cherthala - Oachira and Oachira - Trivandrum (Kazhakkoottam) stretches of the NH-47 are almost through and we can expect work to start by July-August on the long-overdue 4-laning of NH-47 between Trivandrum and Cochin. The tendering of the Kazhakkoottam - TN Border stretch is yet to be completed but we can expect it also to get going by end-2010. Meanwhile, NHAI will complete a study for the Outer Ring Road for Trivandrum as well as for an Expressway starting from Trivandrum till Thrissur. Work on the M.C. Road will also be complete by mid-2010, bringing Pathanamthitta, Idukki and Kottayam districts closer to the State Capital. Institutions: The stunning campus of the IISST is due to open in mid-2010 while the much larger one of the IISER should also be substantially complete by the end of the year. New campuses are also on the anvil for the RGCB, IIITM-K and Asian School of Business. Trivandrum International Airport: After missing its 2009 completion target, the massive 350,000 sq.ft Terminal 3 (hopefully??) along with its 6-lane elevated approach road should be open by April 2010. Simultaneously, the Air India - Boeing MRO complex should swing its giant doors open in June or so. The acquisition of at least a portion of the 80-odd acres promised to AAI for the further expansion of the Airport may be completed within 2010, paving the way for further facilities such as a dedicated cargo terminal and further expansion of T3. We could also see a new ATC tower coming up in 2010. Railway Development: After much ado and no show in 2009, the Railways are expected to put in a much better showing in 2010. First up could be the inauguration of the much-delayed and nearly forgotten MEMU service between Trivandrum and Kollam, sometime in June. Hopefully, this could be followed by the commissioning of new facilities at Kochuveli as it crawls forward to meet its destiny of becoming Kerala's busiest station. Upgradation work at Trivandrum Central and even Nemom could start off in 2010. All in all, nothing much seems to be on the horizon this year on rails, except the odd new train which may end up still-born either due to coach shortage or the perpetual congestion at Trivandrum Central. Tourism: Yes, yet again 2009 was a drab here in this case as well. With demand picking up in 2010, we can expect the launch of a slew of new projects starting with the artificial reef at Kovalam! A number of luxury hotel projects are also in progress or set to start off in the first half of 2010. We can expect some of the global marquee names in the industry to make an appearance including Marriott, Oakwood and Hyatt. 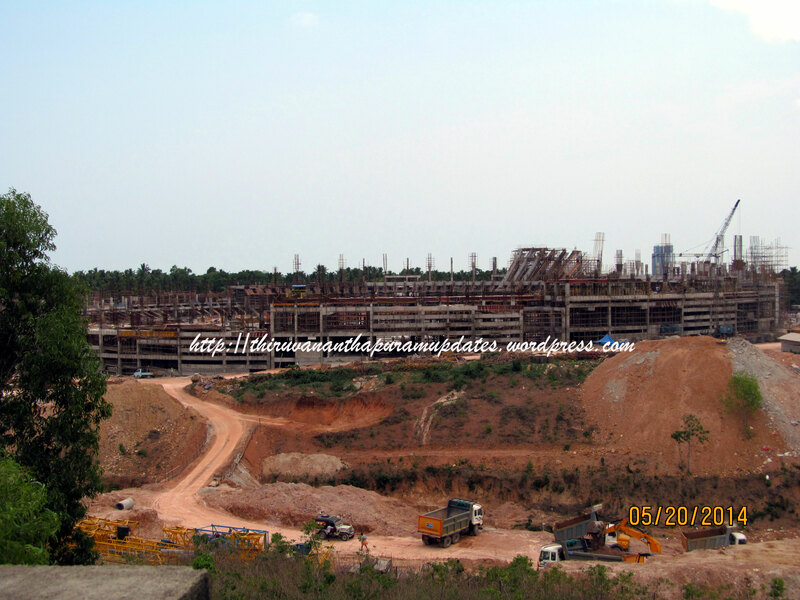 Work on the International Convention Center Complex at Aakulam should also kick off by April 2010. Real Estate: And finally....... ! Despite the slow down having affected Trivandrum the least among the real estate destinations in Kerala and even across India, the action had decelerated, especially with respect to commercial projects. 2010 will see the opening of Trivandrum's first true-blue mall, at M.G.Road while work will kick off on a number of major retail projects in locations as diverse as Sasthamangalam to Pattoor. The residential sector is also going to see a slew of major launches, especially along the IT Corridor along with some luxury properties within the city itself. We can expect a number of major retailers to open their doors in 2010 as well, stay tuned for more. ....and that's it. Many of you may be wondering why I didn't mention the National Games?! Simple, because the 35th National Games of India will be held in Trivandrum in 2011, not 2010. Other initiatives that I have left out like expansion of the Trivandrum Urban Agglomeration, notification of a TCR Master Plan and the outcome of the twinning initiative with Barcelona are mostly intangible in nature and as yet uncertain. Projects like the KSIDC Life Sciences Park and the SIDCO Telecom City are still very much alive but are yet to fructify to an extent when we can make a prediction about them, in view of the experience with much more solid projects in 2008 and 2009. This is my take on what we can expect in 2010. Do let me know your thoughts on the forecast. There will be updates on some of the key projects mentioned here in the days and weeks ahead, so stay tuned! I follow your blog regularly... I am also very much interested in the developments that takes place in our city-TVM..I would also like to be a part of TDF..How do I go about it?Do let me know.. Thank you for the support Vidhya. Drop me a mail at ajaypp@gmail.com and we will take it from there. Look forward to seeing you as part of TDF. Cheers!